Create, design, manage and track QR Codes for great mobile campaigns. Deliver great content in many ways. Link to any web page, grow your facebook followers, promote your apps, view PDFs and images, play an audio file or share your contact data. There is a QR Code template for every purpose. Customize QR Codes with your logo and colors to capture your brand. Creating personalized QR Codes is simple and can bring in a lot more scans. When it comes to scanning QR Codes, print quality is important. 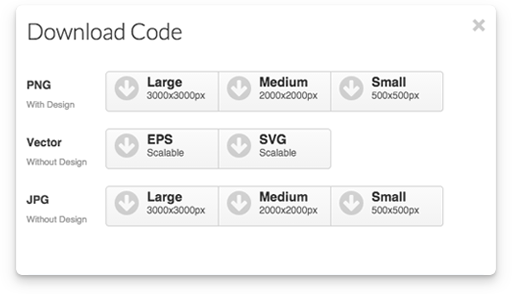 You can choose from high resolution JPG and PNG files or pick an EPS or SVG vector format. Whether you are printing on small business cards or huge posters, there is a file format that works best for your needs. See how often, when and where people scan your QR Codes. All data collected is in real time, certainly making you want to check back in again and again. Scan reports sum up all relevant information, making it easy for you to see how well your campaign is doing. You can still update QR Codes that have already been printed and distributed. Replace web addresses, information or files at any time. 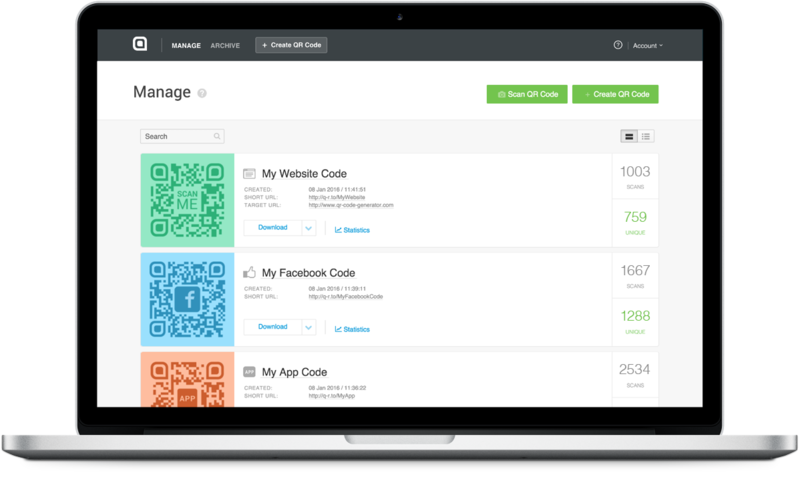 Dynamic QR Codes allow you to bring variety to your campaign or fix mistakes and typos in no time. Choose from a variety of QR Code types made for every goal you have in mind. Update the content or web addresses on already published QR Codes at any time. Customize your QR Codes with your brand colors and logo or select one of our ready-made templates. Download your QR Codes in high resolution JPG and PNG or vector-based EPS and SVG files. 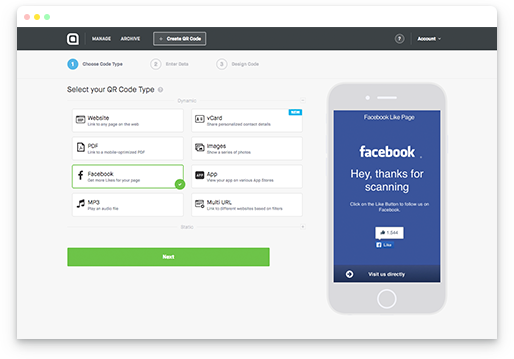 Edit default short URLs on your Dynamic QR Codes or set up your own to build trust. Test the readability and functionality of your QR Codes using the built-in scanner. Find out how many people scan your QR Codes, and even when and where they do so. 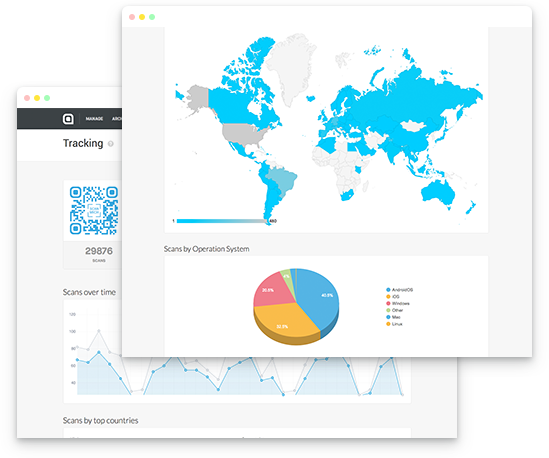 Export your detailed campaign analysis and share it with your colleagues or clients. 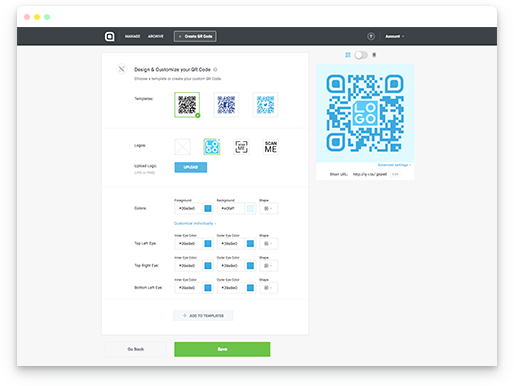 Name, organize, edit, design, download and archive all your QR Codes from one place. 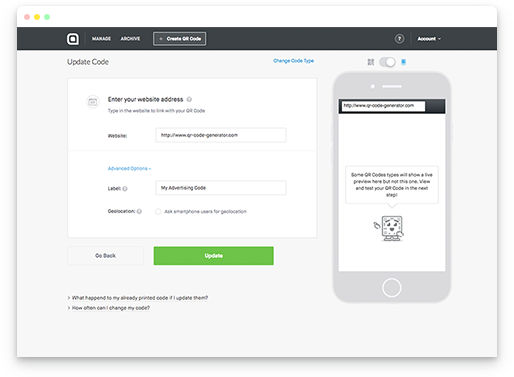 Invite up to five additional team members to access your account with their own login data. Adapt the user interface to your design using your brand colors and company name. Start a chat with our support team and get immediate help directly from your account. Give us a phone call or request a call back if you prefer to talk to us personally. Outside business hours, simply drop us an email and we’ll get back to you very shortly. Find the answers to your questions in our built-in Help Center section, open 24 hours a day. Read or watch our how-to guides crafted for newbies and pros alike. Ti aiutiamo a gestire le tue campagne di marketing di successo con codici QR personalizzati, statistiche sulle scansioni e contenuti ottimizzati per i dispositivi mobili.